The New York Rangers have been working at rebuilding their crop of prospects through the draft, trades and UFA signings. 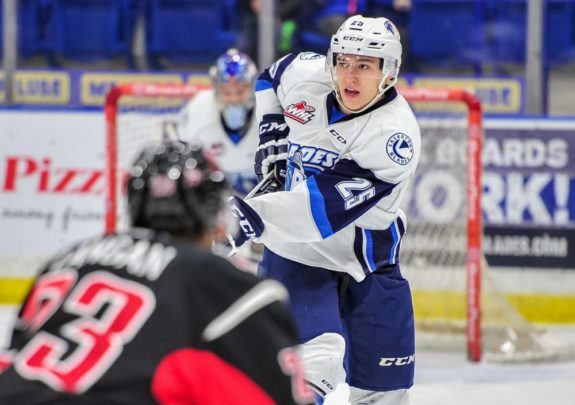 As the season winds down and management decides how to utilize their selections in the upcoming 2018 NHL Entry Draft, it’s time to take a look at their depth at each position. Since many wingers can play on both the left and right side I’ve grouped them together under the heading “Wingers”. Any player that’s listed as a center by Elite Prospects, even if they also play on the wing, has been included in the “Center” list. Don’t worry, goaltenders are still just goaltenders regardless of how well they can play the puck. These depth charts are based on my research and consideration of how likely it is each player will make an impact at the NHL level within the role they will play. To that end, a highly skilled, potential first-pair defender who also has the potential to be a bust may be ranked lower than a less skilled defender with second-pair potential who seems more likely to become a successful NHL player. Call this the Sean Day Effect. This study is subjective and some readers will disagree with my order of selection. I have created a Readers’ Poll where you can submit your own rankings which will be featured in a follow-up article. Here’s a handy reference for Rangers’ prospects statistics when creating your own ranking. With that business sorted, here is my ranking of the Rangers prospects 24-years-old and younger who have less than 41 games of NHL experience. Filip Chytil tops the list which may seem odd considering Lias Andersson was selected before him in the 2018 NHL Entry Draft less than a year ago. Through the Rangers’ training camp and his time in Hartford, the young Czech has shown that he might be viewed as the steal of his draft class. Brett Howden finds himself just under the two most recent Rangers’ top draft picks, though a year from now it would not be surprising to see that change. While many of the centers listed above will likely settle in on the wings at the NHL level, the Rangers’ true crop of wingers is rather shallow. 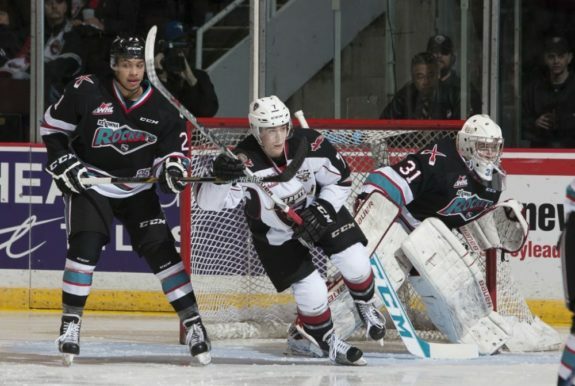 Ty Ronning takes the top spot even though he’s a boom or bust type prospect. His size might be small but his skill level is elite. Ryan Gropp and Vinni Lettieri round out the top three places on my list as they are the most likely to make it at the NHL level. The Rangers have done the most work on retooling their defensive prospect pool. Libor Hajek, acquired in the trade with the Tampa Bay Lightning that sent Ryan McDonagh and J.T. Miller south, finished first. The recent NHL play of undrafted former NCAA defender Neal Pionk, acquired as an unrestricted free agent prior to the start of the season, has seen the young defender jump into the number two spot. 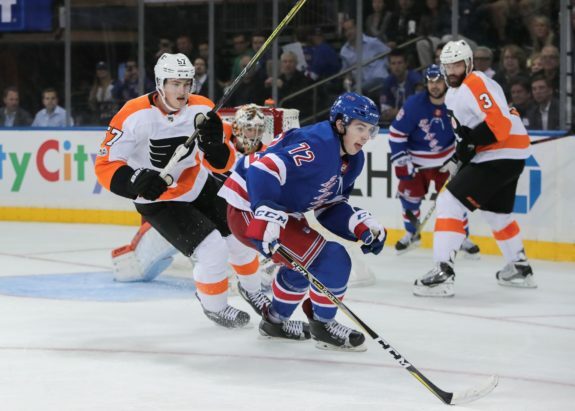 Pionk had shown promise playing for the Hartford Wolf Pack, but his stint with the Rangers has been something of a revelation. The player with the highest ceiling, Sean Day, is fifth on my list because of his huge bust potential and the all-around system depth of the franchise. 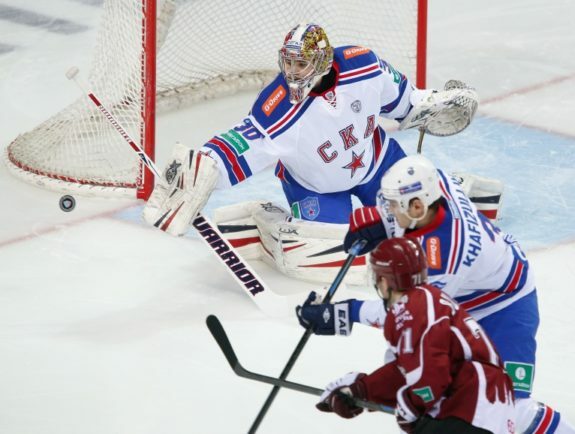 While Alexandar Georgiev seized his opportunity with the Rangers when Ondrej Pavelec went down with injury, Igor Shesterkin, the heir apparent to Henrik Lundqvist, is the clear top goaltending prospect in the Rangers’ organization. He may be their top overall prospect. That doesn’t discount Georgiev’s recent play in the NHL. He has risen the ranks to the number two spot with Adam Huska of the University of Connecticut rounding out the top three. There you have it, the 38 prospects in the Rangers’ system who are under 24-years-old, ranked. As I said earlier, let me know what order you have these prospects in by participating in our Readers’ Poll. I’ll then follow up on these rankings with a report on how the Rangers community sees the team’s prospect pool in comparison to my own rankings. Feel free to offer comments below as well.